To celebrate the Alinghi’s win the in the Americas Cup, AP has created this limited edition of 750 models. Movement is the automatic AP calibre 2229/2845 with 37 jewels (257 parts and components) with a power reserve of 40 hours which beats at 28,800 bph. Finishing includes chamfering, circular-graining on the plate and “côtes de Genève” on the bridges and bars. The case is Titanium with a Platinum bezel. 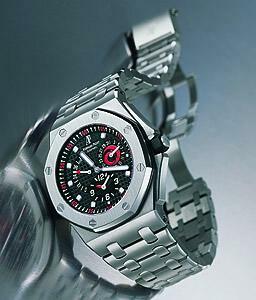 The caseback is stamped with the Alinghi logo and with the words “Alinghi Commemorative Edition America’s Cup 2003”. It is water-resistant to 100 meters. Functions are hours and minutes, pointer-type date display, a power-reserve indicator and a second time-zone.